Who said your dog’s dental routine has to be difficult? 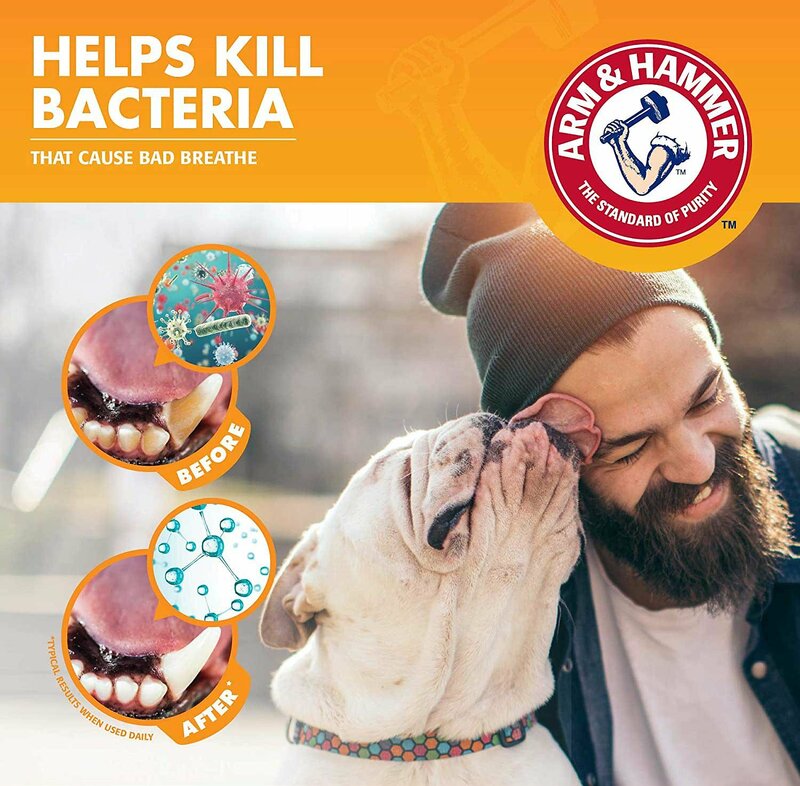 With Arm & Hammer’s Dental Fresh Breath Dog Dental Spray, supporting white teeth and fresh breath is easier than ever! Just spray one to two pumps on each side of your dog’s mouth, directly on his teeth and gums, and let the gentle but powerful baking soda work its magic. Not only will the naturally derived ingredients in this spray help brighten teeth and freshen breath with a refreshing mint flavor, but they will also help your pup maintain clean teeth and healthy gums! Baking soda helps to clean and deodorize your dog's teeth and gums. Powerful enzymes help prevent tartar buildup. Helps freshen your dog’s breath, so you can welcome all his kisses! Actively helps whiten your dog’s teeth. Crafted with a refreshing minty flavor. HAZARDS TO HUMANS: Avoid contact with eyes. Keep out of reach of children. Store at room temperature. Not intended for human use. Water, Sorbitol, Polysorbate 20, Flavor, Sodium Bicarbonate, Lysozyme, Proteases, Thymol, Glucose Oxidase, Chlorophyllin, Sodium Chloride, Zinc Gluconate, Cetylpyridinium Chloride. Lift lips on either side of dog's mouth. Spray 1 - 2 pumps directly onto teeth and gums per side. For best results, do not let dog drink or eat for one hour after use. My two dogs had HORRIBLE breath! Changing food seemed to help some, but this mouth spray twice a day has really improved their stinky dog breath. I'm not so embarrassed now when people come over and want to love on my babies - I'm no longer told how bad they smell. It's at least worth a try if your babies have smelly breath. Although, I think the overall diet change has been a big contributor to the better breath. I moved to American Journey food and that has been great too. I noticed that the teeth are getting whiter each day. We have a Chihuahua and they have problems with their teeth and when we notice that are chihuahuas teeth were getting discolored I ordered the product and I see a difference within a week. I have had a dental procedure but have bad breath. This spray seems to help. I purchased this because one of my dogs will occasionally eat feces (Ew!) and a spritz or 2 Afterwards she has fresh breath again! So it works very well. Of course she dislikes the spray as most will... But it works!